Hadassah Brazil is a wonderful success story that began when a young entrepreneur, Fabio Wajngarten from Sao Paulo Brazil, was invited to be the first South American to join the Hadassah International Board of Directors. Fabio had started his own media research company in Brazil in 2002, a highly innovative enterprise that measures advertiser’s expenditures, branded content and merchandising on TV. Fabio felt that as human beings we need to be aware and sensitive to the causes and the problems of others. He saw Hadassah as a major “door” to responding to and solving many of these problems and wanted to become involved. Fabio and his wife Sophie recently opened their home as hosts to the largest Hadassah event held in Brazil since Hadassah started operations in the country. The event brought together many of the most important business leaders of the Jewish Community in Brazil, as well as many business and religious leaders from the general community. The over 100 attendees gathered to honor the generosity of Luis and Lilian Stuhlberger, the first donors from outside of the USA to sponsor a Chagall Window at the Hadassah Medical Center, Ein Kerem. 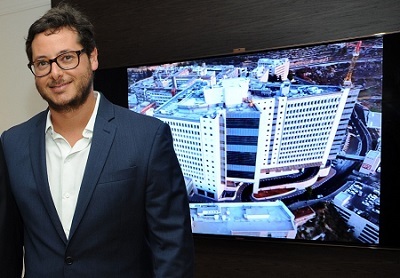 Luis Stuhlberger is considered by the New York Times to be a Brazil Hedge Fund Star. The Stuhlberger’s generous gift to Hadassah associates their name with the beautiful Issachar window painted by Marc Chagall, and at the same time it supports the completion of the Sarah Wetsman Davison Hospital Tower. As a tangible expression of gratitude for their gift, Fabio and Sophie Wajngarten and Hadassah International presented the Stuhlbergers with an original photograph by Yuval Yairi of the Chagall Window representing the tribe of Issachar. As Luis Stuhlberger looked at the green colors of the Issachar window, he shared his personal connection to Chagall and to Hadassah. His story began when as a teenager he visited Hadassah and fell in love with the Chagall Windows. Today, as a leading investor in green technologies, the Issachar Window was a perfect choice for closing a cycle that started decades ago. “The green colors of the Issachar Window represent hope, and that is what Hadassah is about, giving hope to millions of people all over the world”. This outstanding event was also an opportunity for Fabio to inform the attendees about the work of the Hadassah Medical Center in saving lives and its leadership in cutting edge medical research and innovation. Dvir Musai, who survived a terrorist attack as a child and has been a longtime patient of Hadassah, gave an emotional and graphic presentation that showcased how Hadassah doctors go the extra distance to not only help the injured survive, but to do it in a way that guarantees that they still have a quality of life. The Stuhlbergers are not the only major donors to Hadassah from Brazil. In 2015 the Picciotto family was honored for their contributions to the Hadassah Hospital in dedication ceremonies at the Sarah Wetsman Davidson Hospital Tower. Brothers Adolfo and Jack Picciotto and their wives made a large contribution to Prof. Reuven Or’s cutting-edge Bone Marrow Transplantation Research Center. The gift was particularly meaningful as a member of their family had recently died three months after a bone marrow transplant. Elie and Mimi Douer are also committed Brazilian philanthropists who have made a tremendous contribution to Hadassah. Several years ago, Elie’s project, the Elie Douer and Family Center for Pediatric Genetic and Chronic Diseases, made it possible to open a new wing for children with genetic problems at the Jerusalem Hadassah Hospital on Mount Scopus. This Center serves thousands of children, giving them the best professional facilities, comfort and encouragement. “This is the real thing!” Mimi says emphatically. Fabio Wajngarten and his board have the vision, courage and compassion to lead Hadassah Brazil into a bright future. We wish them great success.